There is an eye at the 1-1 point?, and a potential eye at the side. is the makuri technique which robs the potential eye. Notice that is exactly the bao chi technique for capturing except that is under atari. To save , the only move is to capture at . Then pulls out and leaves Black with a false eye at . If is played here, then can capture and live. From the life-and-death perspective, exchanging with before playing also kills. However, professionals and dan players do not play this way, because such exchanges are often seen as slightly suboptimal, but the reasons why it is slightly loss-making is rather subtle. In this case, two reasons can be offered. 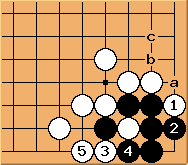 Firstly, should the outside White stones get involved in a capturing race such that White needs to capture the Black corner, Black can capture at a, forcing White b, increasing Black's liberties and creating a ko mouth which means potential for trouble. 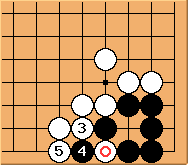 Secondly, Black c becomes a threat to bridge under via a ko. 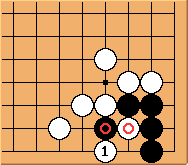 Without the and exchange, there is no potential for Black c to be a sente move.